Harry Winston presents the Premier Moon Phase 36 mm, a poetic and surprising timepiece. Whereas in the majority of moon-phase mechanisms, the moon disappears completely before beginning a new cycle, here the golden moon takes cover behind a delicate mother-of-pearl lattice, hidden but not completely out of sight. This supremely elegant design echoes the light and shade cast between Earth and the sun in a completely unprecedented manner. 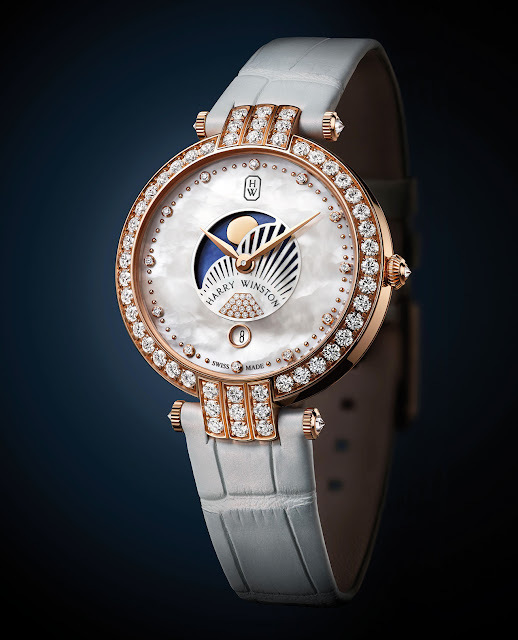 The deep blue mother-of-pearl sky forms an eloquent contrast with the immaculate white mother-of-pearl dial, a composition that irresistibly draws the eye to the centre of the watch. Bringing this magical tableau to life, 18 brilliant-cut diamonds are set just above the date at 6 o’clock, like a sunbeam reflecting the halo of precious stones that adorn the dial, bezel, arches and buckle. Together they form a dazzling ensemble of 104 diamonds for 2.58 carats. Hours, minutes, moon phase, date. 18K pink gold set with 57 brilliant-cut diamonds (~ 2.32 cts), 36 mm. Sapphire crystal, closed back, water-resistant to 30 metres (3 bar/100 ft). 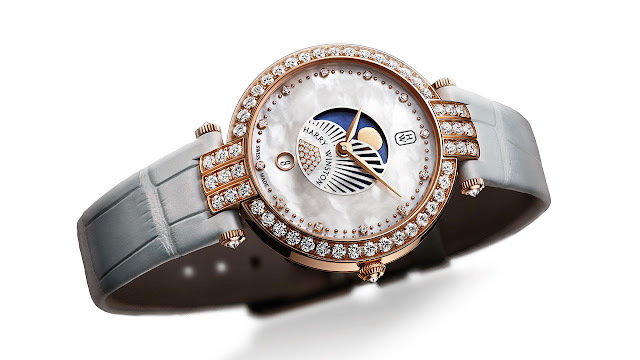 White mother-of-pearl, blue mother-of-pearl moon phase in the centre, diamond hour-markers (~ 0.078 cts), gold cabochons, pavé of 18 diamonds in the centre (~ 0.036 cts), date at 6 o’clock. White alligator, 18K pink gold buckle set with 17 brilliant-cut diamonds (~ 0.15 cts).